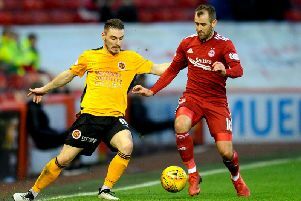 Tuesday night saw a vastly improved Aberdeen team from the one Stenny drew 1-1 with at Pittodrie knock The Warrior out of the William Hill Scottish Cup with ease. At half time in the Granite City the Dons had scored with their only real opportunity in the first half and Colin McMenamin made it clear to his players that if they got one chance they had to take it in order to cause another famous upset. However, this time around, the Premiership side were far more clinical and managed to score three first half goals to end the tie as a contest before 40 minutes of the replay had passed at Ochlview. Stenny did manage to pull a goal back in the second half but the visitors restored their three goal cushion not long after and saw the match out to set up a Last 16 home game against Championship side Queen of the South. Former Stenny manager Terry Christie watched from the stands hoping Colin McMenamin’s side could find some of the same magic that his players did in 1995 when they beat Aberdeen 2-0 at Ochlview. However, The Warriors got off to the worst possible start as Northern Irish international Niall McGinn gave the visitors the lead after just 10 minutes when he finished off a Scott Wright cut back from inside the box. The Dons were 2-0 up on the half hour mark after Graeme Smith brought down Greg Stewart inside the penalty area and striker Sam Cosgrove netted from the penalty spot, low in to the bottom right corner. Then, just eight minutes later, a piece of brilliance from Stewart killed the game. The on-loan Brimingham City attacker picked the ball up on the edge of the box with his back to goal before a neat turn sent him in on goal where he lofted the ball over the advancing Smith. Aberdeen had shown the quality they failed to demonstrate at Pittodrie ten days earlier and the cup tie was all but decided just half way through. However, you do not earn a nickname like The Warriors by laying down and accepting your fate and the home side would strike a blow back against their opponents to give themselves the slightest glimmer of hope in the second half. 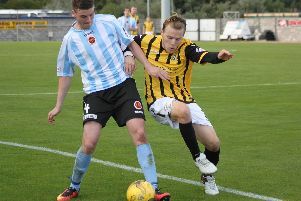 In the 52nd minute from an Aberdeen corner, Stenny broke up the park with Conner Duthie driving through the middle. The ball eventually came to Mark Ferry who unleashed a piledriver of a shot from about 25 yards which forced a spectacular save from Joe Lewis to tip it over the crossbar. From the resulting corner kick Andy Munro rose highest to head home and make it 3-1. Once again, Colin McMenamin’s half time team talk had clearly sparked some life in to the Stenny players who let their Premiership opposition know they would get no easy passage in to the next round at Ochlview. Unfortunately, any momentum they were building was sapped out of the Stenny players on 67 minutes when a bizarre Ruaridh Donaldson own goal restored the visitors three goal lead and killed off any hopes of a miraculous come back. The full back met the ball inside the box with a great header right in to the top corner of the goal - unfortunately it was his own. That was that and the visitors saw the game out to its conclusion to box their spot in the next round and eliminate Stenny from this season’s Scottish Cup. However, The Warriors and their fans have plenty to take away from this tie with a memorable 1-1 draw at Pittodrie and a packed out Ochlview in the replay which has done enough to significantly improve Colin McMenamin’s budget in this January transfer window.